Quite often, I find that hotels won’t take pets and if you’re a dog owner like I am, it would seem utterly bizarre not to bring your best friend along with you to such a place. So why not seek out a homely cottage that will happily house you and your adorable mutt? Similarly, people with children can find hotels a bit limiting. Costs can start to stack up especially when you lack self-catering facilities and are forced out for your meals. Cottages will afford you total flexibility so you can eat when you like and however much you like! You’ll also find it easier to cater to the pickiness of your family just as you would at home. Then there’s the added luxury of space to spread out in so you don’t all drive each other crazy. Couples also like to head to the Lakes for a romantic getaway now and again. A lot of couples prefer to rent cosy little cottages with log fires, tucked away into a craggy mountainside. It’s a lot more romantic than a brightly-lit full English at the local chain hotel! The peace and tranquillity of a beautiful cottage will provide a much more amorous atmosphere. Perhaps you are trying to arrange a group walking holiday with your friends. 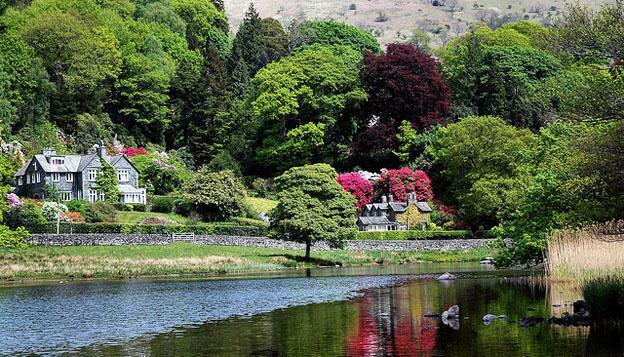 A lot of people arrive in the beautiful Lakes en masse in need of somewhere suitable to stay. Hotels can quickly become unaffordable for some whereas splitting the cost of a large cottage may well bring down the price overall for everyone. You can then enjoy having a base at which you can enjoy long, leisurely meals and come and go as you all please without being restricted to set meal times. A lot of people head to the Lakes to celebrate their stag and hen dos. If you are tempted, why not look into the possibility of renting a cottage for you and your mates? Some places can cater for quite large numbers but remember to always treat these homes with the utmost respect. With such a vast array of cottages available, choosing one can quickly become overwhelming. A good place to start is with on-line reviews. There are plenty of sites offering full and frank reviews of holiday accommodation and they can usually be relied upon to provide an honest account of the quality of the houses. So do your research and even ask around on-line (forums are a great place to find lots of objective advice) and you’ll soon find the perfect house for your needs. Remember to contribute after you’ve come back from your holiday as well. Just as you found the reviews and opinions useful in making your decision, there will be people out there keen to hear what you thought too and it’ll give the cottage owners some food for thought as well. So if I have convinced you to start looking into holiday cottages in the Lake District you may want to look into the costs and locations further. The are dozens of beautiful cottages to choose from and they are my first stop when looking for a holiday home.